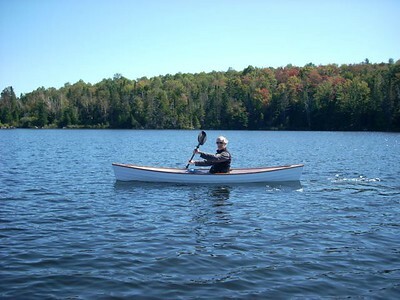 Lou built a solo canoe in 2007. It was a great project -- and, yes, it floats! 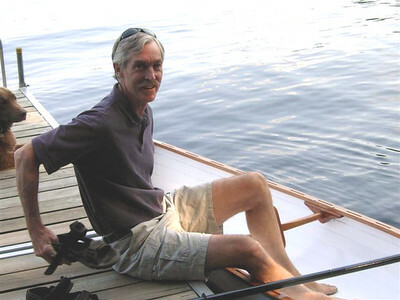 I purchased a set of plans for a solo canoe from Thomas J. Hill, a boat designer in Burlington. 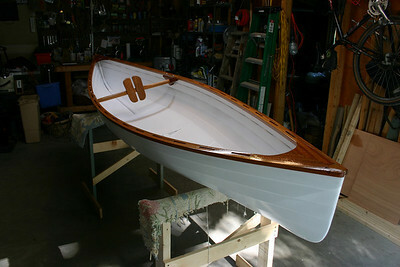 The boat is one of several featured in his book "Ultralight Boatbuilding." 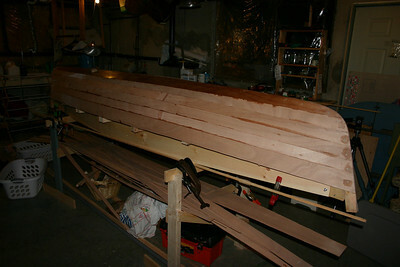 The first step was to construct the form, over which the canoe would be built. 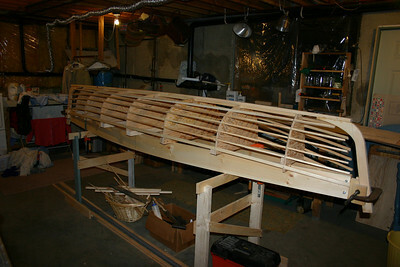 The form determines the exact shape of the canoe and was constructed of plywood, spruce boards, and spruce strips. In this picture the first two pieces of the actual canoe, the keelson and the stem, have been attached to the form. I built the canoe in my basement. 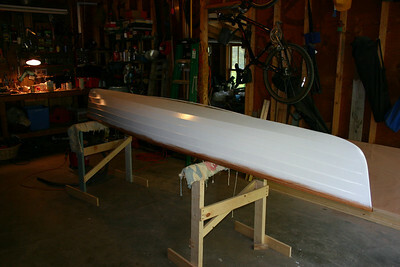 The basic process for building the canoe involves attaching plywood strips, called "strakes" to each other with epoxy glue, using the form to hold them in place until they dry. 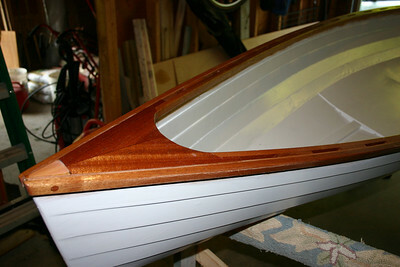 The strakes overlap, hence the name for this style of canoe -- "lapstrake." 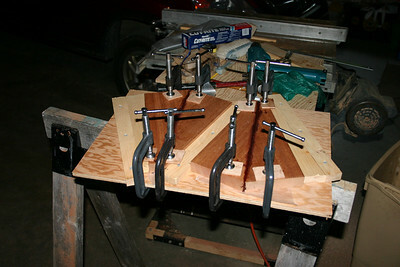 Each plywood strake is measured in place and then cut with a jigsaw before it is glued. All of the strakes are in place in this photo. At this point I moved the canoe upstairs to the garage. In the garage I removed the canoe from the form and placed it in a cradle for the remaining finish work. 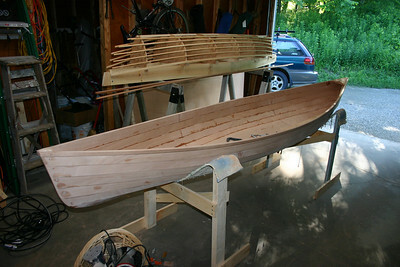 First I made the two small "decks" for the front and back of the canoe. These were also made of mahogany, but can also be made of pine or spruce to save weight. The decks are installed on each end and then cut to a rounded shape (for a comfortable hand hold), with tabs on each side to accept the inwale. 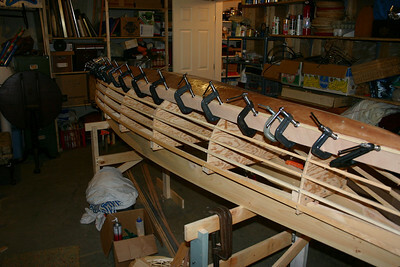 The left side of the canoe in this photo shows the outwale and the small spacer blocks that are attached before the inwale is glued on. 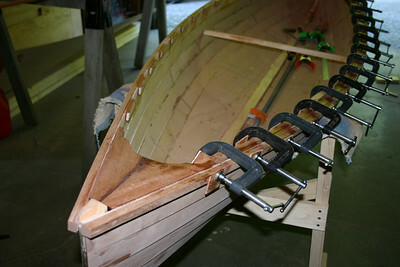 The clamps are holding the inwale which has just been attached on the right side of the canoe. Lots of clamps are needed! After lots of sanding, I painted the hull with four coats of marine epoxy. I used several coats of varnish on the mahogany trim. The finished canoe, with a small plywood "seat" and a back rest that rotates to fit each person. The canoe is paddled like a kayak, sitting on the bottom with a double bladed paddle. I use a small camping chair, which provides padding on the seat and back. The maiden voyage of the "Hannah Belle" at Spring Pond Camp, Saranac Lake, August 2007! Paddling on Noyes Pond, Groton, Vermont, Fall 2008.